You had an angioplasty done when you were in the hospital. You may have also had a stent (a tiny wire mesh tube) placed in the blocked area to keep it open. 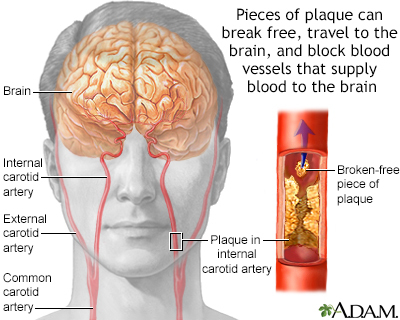 Both of these were done to open a narrowed or blocked artery that supplies blood to your brain. Your health care provider inserted a catheter (flexible tube) into an artery through an incision (cut) in your groin or your arm. Your provider used live x-rays to carefully guide the catheter up to the area of the blockage in your carotid artery. Then your provider passed a guide wire through the catheter to the blockage. A balloon catheter was pushed over the guide wire and into the blockage. The tiny balloon on the end was inflated. This opened the blocked artery. You should be able to do most of your normal activities within a few days, but take it easy. Walking short distances on a flat surface is ok. Limit going up and down stairs to about 2 times a day for the first 2 to 3 days. DO NOT do yard work, drive, or play sports for at least 2 days, or for the number of days your doctor tells you to wait. Your provider will tell you how often to change your dressing (bandage). If your incision bleeds or swells, lie down and put pressure on it for 30 minutes. If the bleeding or swelling does not stop or gets worse, call your doctor and return to the hospital. Or, go to the closest emergency room, or call 911 right away. If bleeding or swelling are severe even before 30 minutes have passed, call 911 right away. DO NOT delay. If you are taking medicines for blood pressure or diabetes, take them the way you have been told to take them. Your provider may ask you to take aspirin and/or another medicine called clopidogrel (Plavix), or another medicine, when you go home. These medicines keep your blood from forming clots in your arteries and in the stent. DO NOT stop taking them without talking with your provider first. You have problems with your eyesight or you cannot talk normally. Your leg or arm below where the catheter was inserted changes color or becomes cool to touch, pale, or numb. Cheng CC, Cheema F, Frankhauser G, Silva MB. Peripheral arterial disease. In: Townsend CM Jr, Beauchamp RD, Evers BM, Mattox KL, eds. Sabiston Textbook of Surgery. 20th ed. Philadelphia, PA: Elsevier; 2017:chap 62.